Here is a cool website for you to check out. It is based on The Simpsons Movie, and there are many cool things to do on the website. My favorite is where you get to create your own Simpsons character. 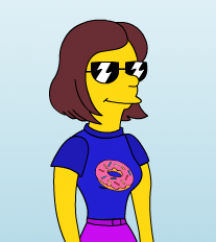 To do this, got to the top of the page and click on "CREATE YOUR SIMPSONS AVATAR". Once you put your mouse over it, something will come up, and it should say "CREATE AVATAR." Click on it. When you get to the page, just have fun and make your own original character! This is a link to a Word cloud that Andy made with the words in my news header blog. This is a cool thing where you can add where you are from, and see where other people are from too! You can add yourself too, if yo want!